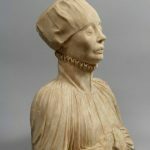 In the last (Spring) edition of the CODART eZine Cynthia Osiecki published an article on Dutch and Flemish sculptors to the Baltic region in the second half of the sixteenth century. One of the artworks she discussed was the Epitaph for Dorothea of Denmark formerly in the Königsberg Cathedral in Kaliningrad, Russian Federation and that was presumed to be destroyed in 1944. Cynthia Osiecki now has exciting news. Glancing through photographs made by a friend who visited the Pushkin Museum in Moscow, one photo stood out. This picture, made through the glass of the display case, was the familiar bust of Dorothea of Denmark, made by the Antwerp sculptor Cornelis Floris in de 40s of the sixteenth century. The bust was placed in her epitaph in the Cathedral of Königsberg (now: Kaliningrad). Formerly the photo was in black and white, but now the material was white with red/pink streaks. This looked like the original, only known in the ‘West’ through a black and white photograph that was taken before the Second World War and now kept in the collection of Instytut Sztuki Polskiej Akademii Nauk [Art Institute of the Polish Academy of Sciences] in the Polish city of Warsaw. 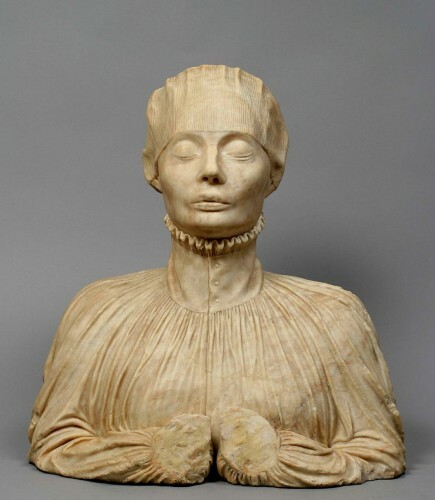 The epitaph of Dorothea of Denmark, the wife of the Duke of Königsberg Albert of Brandenburg-Ansbach, played an important role in the literature concerning the sculptural works of Cornelis Floris. 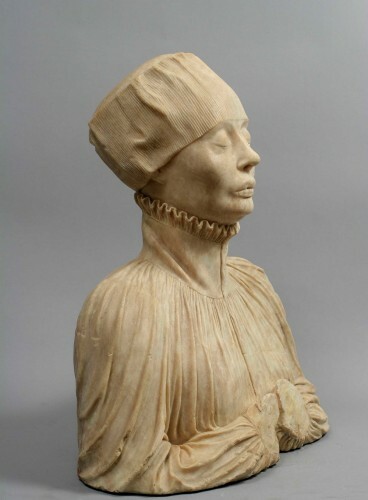 Ordered on 11 April 1547 it is the earliest traced work of this Antwerp master sculptor in the Baltic Sea Area. And is seen as the first sign of the taste for works of Floris, which were highly present in the next seventy years. 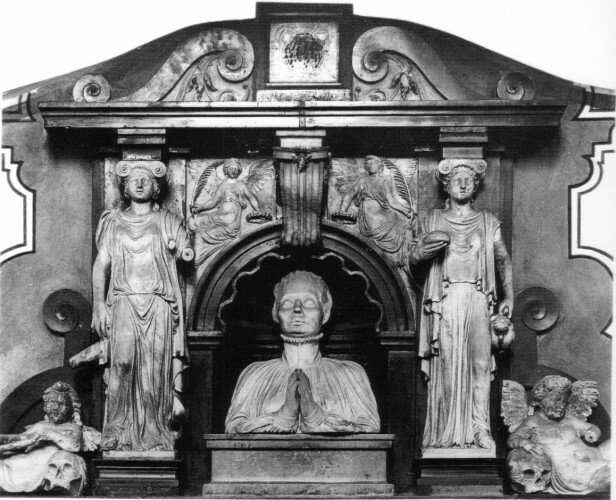 Cornelis Floris executed more works for the Cathedral in Königsberg: the wall-tomb for Albert of Brandenburg-Ansbach and the epitaph for his second wife Anna-Maria of Prussia, which was placed opposite of Dorothea’s epitaph. The faith of the last mentioned epitaph is still unknown. Is it lost or also on a still unknown location? The literature concerning Floris, including the monograph ‘Cornelis Floris, 1514-1575: beeldhouwer, architect, ontwerper’ published in 1996 only depicted the pre-war photograph, not knowing the work was preserved in Russia. 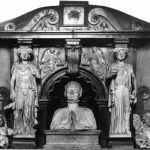 Also at the exhibition in 1968 in Düsseldorf titled ‘Albrecht von Brandenburg-Ansbach und die Kultur seiner Zeit‘ a plaster cast of the bust of Dorothea was shown, which is in the collection of National Historical Museum Frederiksborg in Denmark. After the first excitement and trying not to have too high expectations, the curator Prof. Dr. Vadim Sadkov, head of the old master department of the Pushkin Museum and member of CODART, confirmed that the exhibited bust is the original work of Floris. The sculpted portrait was brought by the Russian Army from Königsberg to Moscow in 1944. Here it remained until recently it was put on display in room 8 of the Pushkin Museum, where it can be admired by visitors. For Russia it is not a new discovery, but for art historian scholars in the ‘West’ it is an unknown original of Cornelis Floris. This high quality alabaster work can be added to his oeuvre. 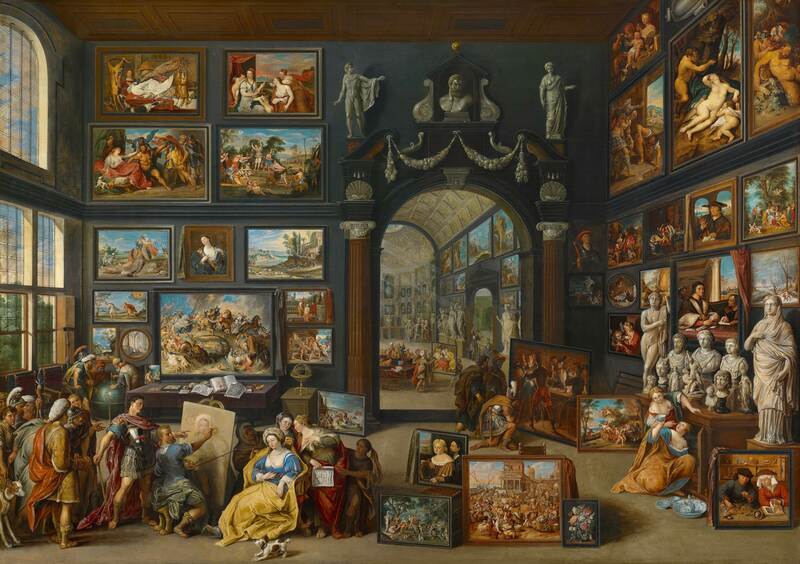 The art history of East and West was separated for many years. 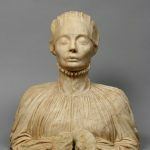 This rediscovery proofs that for a western art historian the collections in Russia still holds a lot of treasures, waiting to be rediscovered.